bargain_world_888 has no other items for sale. Whether it's homework or household finances, this Jumbo Desktop Calculator will make the job easier. 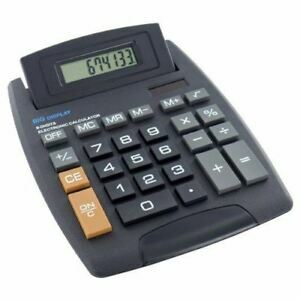 Its large, eight-digit display and colour-coded keypad make it simple to use for quick sums and complex calculations alike, and a full range of memory buttons is featured. The display tilts for more comfortable viewing, while there's no need to worry about the replaceable AG10 battery running out, thanks to the calculator's additional solar panel. Good quality ,good style- it all adds up to a great product !